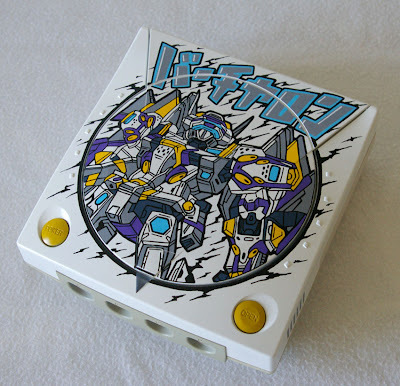 French artist Oskunk (or, OSKUNK!, to be completely accurate) has conjured up a number of fabulous, custom-painted consoles over the years. Surprisingly, most of my personal favorites have been Sega-centric, such as the Dreamcasts he's covered in Jet Set Radio, REZ, Samba de Amigo, Shenmue and Space Channel 5 designs. The artist's latest (below) creation calls to mind yet another Sega classic: 1995's Virtual On. I really like how this illustration complements, rather than attempts to cover up, the curves and grooves of the Dreamcast's top lid. Where will Oskunk's imagination take him next? I'm hoping it'll take him to wherever he needs to go to produce a ChuChu Rocket-branded Dreamcast, or maybe a Magical Puzzle Popils-branded Game Gear. Amen. Chu Chu Rocket is the obvious choice! Really. I'm actually shocked he has yet to make one, Justin. Maybe he's working on one now?